The leader of the BANZARE was Sir Douglas Mawson and there were several subcommanders (Captain K.N. MacKenzie, who replaced Captain John King Davis for the second summer) on board the RRS Discovery, the ship previously used by Robert Falcon Scott. The BANZARE, which also made several short flights in a small plane, mapped the coastline of Antarctica and discovered Mac. Robertson Land and Princess Elizabeth Land (which later was claimed as part of the Australian Antarctic Territory). The voyages primarily comprised an "acquisitive exploratory expedition", with Mawson making proclamations of British sovereignty over Antarctic lands at each of their five landfalls—on the understanding that the territory would later be handed to Australia (as it was in 1933). One such proclamation was made on 5 January 1931 at Cape Denison, the site which Mawson's Australasian Antarctic Expedition had occupied in 1912–13. A hand-written copy of the proclamation was left at the site, enclosed in a container made of food tins and buried beneath a cairn. The letter was retrieved in 1977 by an Australian Antarctic expedition, and is part of the Mawson collection at the National Museum of Australia. The BANZARE was also a scientific quest, producing 13 volumes of reports, on geology, oceanography, meteorology, terrestrial magnetism, zoology and botany, between 1937 and 1975. Robert Falla was the assistant zoologist. ^ "Sir Douglas Mawson collection". National Museum of Australia. Retrieved 27 September 2014. B.A.N.Z. Antarctic Research Expedition 1929–1931 Reports (1937–1975), Adelaide: BANZAR Expedition Committee & Mawson Institute for Antarctic Research, University of Adelaide. Collis, Christy (2004) The Proclamation Island Moment: Making Antarctica Australian. Law Text Culture 8:1–18. Price, A. Grenfell (1962) The Winning of Australian Antarctica: Mawson's BANZARE voyages, 1929–31: based on the Mawson Papers, Sydney: Angus & Robertson. Wikimedia Commons has media related to BANZARE. All features of Antarctica listed in one single *.TXT-File, provided by the United States Geological Survey (USGS) In this document, BANZARE appears often, a search for "BANZARE" shows which features BANZARE was involved with. The Mawson Station, commonly called Mawson, is one of three permanent bases and research outposts in Antarctica managed by the Australian Antarctic Division (AAD). Mawson lies in Holme Bay in Mac Robertson Land, East Antarctica in the Australian Antarctic Territory, a territory claimed by Australia. Established in 1954, Mawson is Australia's oldest Antarctic station and the oldest continuously inhabited Antarctic station south of the Antarctic Circle. The Rouse Islands or Rouse Rocks are a small group of islands in the eastern part of Holme Bay in Antarctica, fringing the coast of Mac Robertson Land close south of Welch Island. The Rouse Islands have an elevation of 28 m (92 ft). The Rouse Islands were discovered on February 13, 1931, by the British Australian and New Zealand Antarctic Research Expedition (BANZARE) under Sir Douglas Mawson, who named them for E. J. Rouse of Sydney, who assisted the expedition with photographic equipment. The Rouse Islands have since been found to be islands. Sir Robert Alexander Falla, KBE CMG was a New Zealand museum administrator and ornithologist. Aagaard Islands also known as Bjarne Aagaard Islands or Ostrova B'yarne-Ogor, are a group of small islands lying to the west of Proclamation Island and Cape Batterbee, near the coast of Antarctica in the Southern Ocean. They were discovered in January 1930 by the British Australian and New Zealand Antarctic Research Expedition (BANZARE) under Sir Douglas Mawson, and were named after Bjarne Aagaard. Proclamation Island is a small rocky island 2.5 nautical miles west of Cape Batterbee and close east of the Aagaard Islands of Antarctica. Mount Elkins, also known as Jökelen is a dark, steep-sided mountain with three major peaks, the highest 2,300 meters (7,500 ft) above sea level, in the Napier Mountains of Enderby Land. 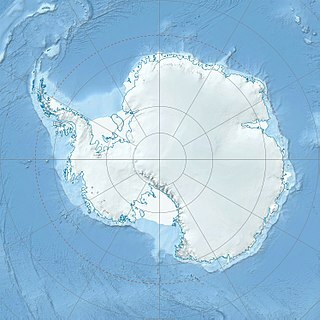 Enderby Land part of East Antarctica, and is claimed by Australia as part of the Australian Antarctic Territory. The mountain was named after Terence James Elkins, an ionospheric physicist with the Australian National Antarctic Research Expeditions at Mawson Station in 1960. Kenneth Norman MacKenzie was an officer in the merchant fleet known for his role in the British Australian and New Zealand Antarctic Research Expedition, for which he was awarded a Polar Medal.